Elections Alberta released the financial disclosures showing the results of political party fundraising in the third quarter of 2017. 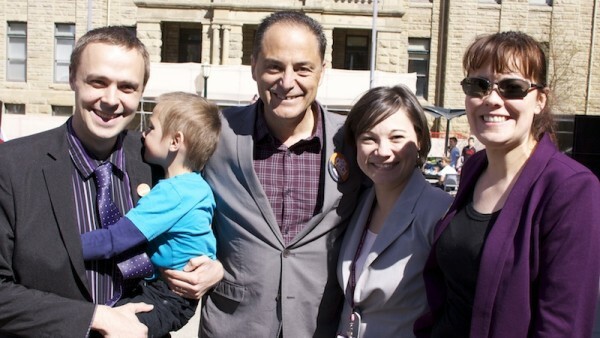 The NDP continue to demonstrate an impressive ability to raise money in Alberta. The NDP has raised the most of any party in the first three quarters of 2017. This is the United Conservative Party’s first-ever quarter of fundraising, and I expect the party will raise significantly larger amounts in the next quarter when it has a permanent leader and when annual contribution limits reset before the first quarter of 2018. This was likely the final quarter that the Progressive Conservative and Wildrose parties will report any significant fundraising amounts. Both parties are now controlled by the board of directors of the UCP. Funds donated to the two parties in the third quarter cannot be transferred to the UCP or any other party. The Alberta Party is attempting to position itself as a centrist alternative to the NDP and UCP, but it will not be much of a political force going into the 2019 election if it party cannot start raising significantly more funds than it has in the first three quarters of 2017. I would not be surprised if these embarrassingly low fundraising returns raise questions inside the party about the future of Greg Clark‘s leadership. I expect the influence of the Alberta Together group and the influx of former PC Party officials into the Alberta Party will force the issue at the party’s annual general meeting on November 18, 2017. A number of third-party advertisers (frequently referred to by the media as Political Action Committees) raised significant amounts of funds in the third quarter. I hope to delve a little deeper in this issue in a future post. This entry was posted in Alberta Politics and tagged Alberta NDP, Alberta Party, Alberta Political Party Fundraising, Elections Alberta Financial Disclosures, Financial Disclosure, Greg Clark, Money and Politics, Political Party Fundraising, United Conservative Party on October 20, 2017 by Dave Cournoyer. Elections Alberta has released the results of political party fundraising from the third quarter of 2016 and it shows that the Alberta NDP raised more money than the Wildrose Party for the first time since the second quarter of 2015. This marks the second best fundraising quarter for Rachel Notley‘s NDP since the party was elected to government in May 2015. The results for the Wildrose Party represent a significant drop in fundraising for the official opposition party. This is the first time since the third quarter of 2015 that the Wildrose Party has raised less than $400,000 in a quarter. 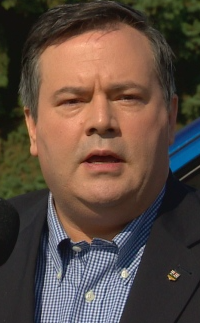 With Wildrose supporter Jason Kenney a contender for the Progressive Conservative Party leadership, it will be interesting to see whether traditional Wildrose donors have decided to shift their financial support. And in the midst of a leadership race, the PC Party increased their fundraising income to $48,209.16, up from $27,376 in the second quarter of 2016. The PCs have struggled to raise funds since the NDP banned corporate donations to political parties in 2015. This entry was posted in Alberta Politics and tagged Alberta NDP, Alberta PC Party, Alberta Political Party Fundraising, Money and Politics, Third Quarter Financial Disclosure, Wildrose Party on October 17, 2016 by Dave Cournoyer. Elections Alberta released the results of this year’s second quarter of fundraising for provincial political parties this week. Following the release of the disclosures I took a closer look at last quarter’s results and what they could mean for the parties. The Alberta NDP raised ten percent less than they did in the first quarter of 2016, which marks the third best full quarter fundraising results since the party formed government in May 2015. The NDP have never led party fundraising but they appear to have developed a healthy and significant base of individual donors. Note: The NDP do not register donations to individual constituency associations, so all funds raised are disclosed through the central party. 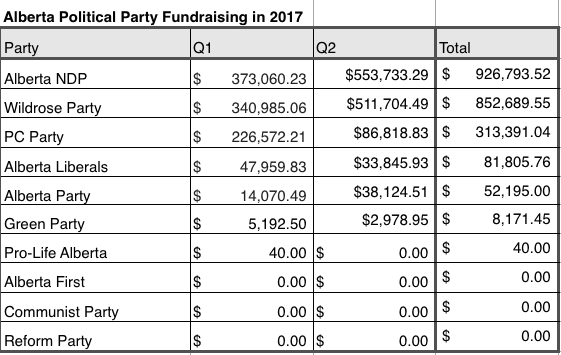 The Wildrose Party maintained its fundraising lead over the NDP by raising the most funds of any party the second quarter. This is a good sign for leader Brian Jean, who’s position as leader of Alberta’s conservatives is being challenged by federal Conservative Member of Parliament Jason Kenney through a hostile take-over bid of the PC Party. 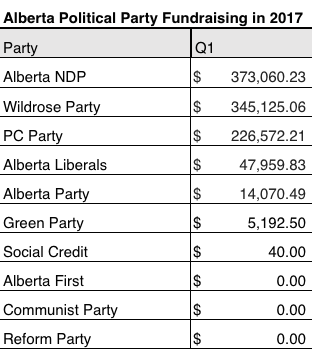 Not counted in the chart above is the funds raised by constituency associations in the second quarter, including Highwood which raised $17,545, Strathmore-Brooks which raised $8,350 and Calgary-Foothills which raised $8,100. Drumheller-Stettler Wildrose MLA Rick Strankman and his wife Diane Strankman donated $1,500 to the Vermilion-Lloydminster Wildrose Association, that constituency association’s largest donors in the second quarter. The constituency is represented in the Legislative Assembly by PC MLA Richard Starke. Gary Bikman, an MLA who crossed the floor from the Wildrose to the PCs in December 2014, donated $500 to the Wildrose association in Cardston-Taber-Warner. He represented the constituency from 2012 to 2015 and was defeated in his bid to become the PC candidate in 2015. Long gone are the days of secret trust funds and overflowing campaign war-chests. This was a dismal second quarter for the former governing Progressive Conservative Party, which raised only $27,376. This was the party’s second worst quarterly fundraising result in recent memory, which is not a good sign as the PCs are set to begin a leadership race on October 1, 2016. But the poor showing by the central party is somewhat deceiving as some local PC constituency associations raised a significant amount of funds in the second quarter: $11,090 in Calgary-Hays, $10,166 in Vermilion-Lloydminster, $10,100 in Calgary-West, $9,386 in Calgary-Northern Hills and $8,277 in Grande Prairie-Wapiti. For the Alberta Liberals, the good news is they increased the quarterly fundraising by 97 percent, the bad news is that they only raised $57,561.04, which is less than their highest quarter last year (they raised more than $110,000 in the first quarter of 2015). Worth noting is a fundraising reception the Liberals are holding on July 21 at the Mayfair Golf Club that will be hosted by Marc de La Bruyere, chairperson of MacLab Enterprises and a well-connected businessman (he also donated $5,000 to the PC Party during the 2015 election). After the election of their first elected MLA in 2015, the Alberta Party appears to still be struggling to develop a sustainable base of donors. Unlike the other parties, the newish party is without an already established fundraising network, which takes significant time and resources to develop. This entry was posted in Alberta Politics and tagged Alberta NDP, Alberta Political Party Fundraising, Brian Jean, Diane Stankman, Gary Bikman, Jason Kenney, Marc de la Bruyere, Money and Politics, Richard Starke, Rick Strankman, Wildrose on July 20, 2016 by Dave Cournoyer. I was browsing through Elections Alberta Financial Disclosures earlier this week and updated some old charts I created in April 2015, mere days before last year’s election was called. The charts below track political party fundraising over the past eleven years, showing the ups and downs of the different parties. Last year marked many firsts in Alberta politics, but in relation to fundraising it was the first year that political parties were banned from accepting donations from corporations and unions. This change was the made in the first law passed by the the New Democratic Party government. Not surprisingly, the NDP had its most successful fundraising year in 2015, raising nearly $3 million over the course of the entire year. Despite the floor crossings that crippled the party in late 2014, the Wildrose Party bounced back with healthy fundraising for 2015. The Progressive Conservatives, Alberta’s natural governing party from 1971 to 2015, broke records in fundraising and at the polls last year (in very different ways). The Liberal Party has struggled with fundraising over the past eight years, starting from its decline after the 2008 election. 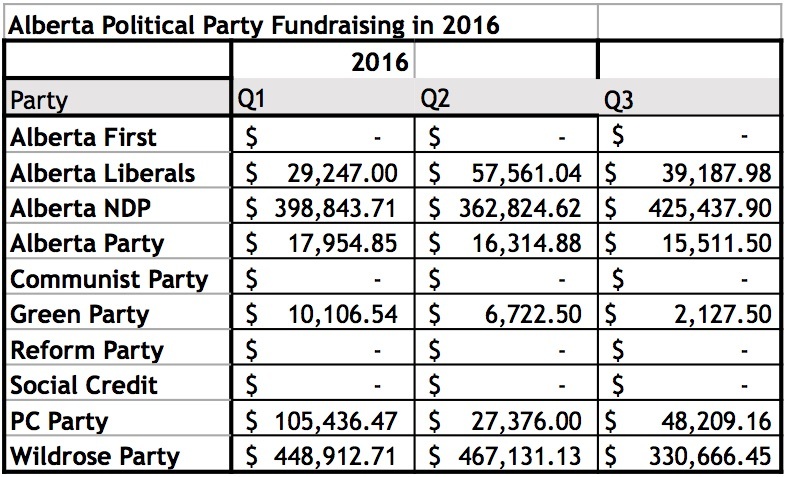 And the Alberta Party, which elected its first MLA in 2015, is still dwarfed by the fundraising of the other parties. This entry was posted in Alberta Politics and tagged Alberta Liberal Party, Alberta NDP, Alberta Party, Alberta Progressive Conservative Party, Elections Alberta Financial Disclosures, Money and Politics, Political Party Fundraising, Wildrose Party on March 11, 2016 by Dave Cournoyer. Reports of the death of the Progressive Conservative Association of Alberta might only be slightly exaggerated. Financial disclosure reports submitted to Elections Alberta show the former governing party amassed a $1.5 million debt during the May 2015 election. After reportedly nearly missing the deadline to submit its financial disclosures from the recent provincial election, the PCs posted the disclosure on its own website, which provides some detail into the overwhelming wealth of the former governing party during its failed attempt at re-election in May 2015. 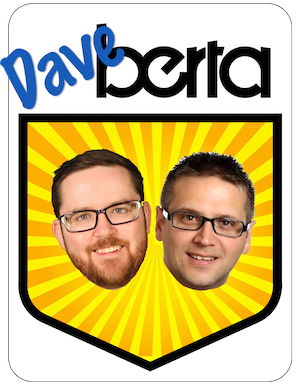 (The full report is now posted on the Elections Alberta website). The disclosure report provides information about a $2,000,000 loan secured by the PC Party from the Canadian Western Bank with an outstanding balance of $1,544,866 as of July 5, 2015. Security on the loan includes a personal guarantee of $1,455,000 from a former director, who is unnamed in the document. The report shows the PCs raised $2,802,500 in donations greater than $250 and $90,625 lower than $250 during the April 7 to July 15, 2015 campaign period. The PCs spent $4,303,969 and ran a deficit of $930,236 during the election campaign. In response to its financial troubles, the party received significant financial transfers from some of its wealthier constituency associations, including $30,000 from Edmonton-Whitemud, $25,000 from Calgary-Elbow, $20,000 from each Calgary-Varsity and St. Albert, and $15,000 from Whitecourt-Ste. Anne. Major donors listed on the PC Party’s financial disclosure include Richard Haskayne ($30,000), Ronald Joyce ($30,000), Ken King ($30,000), Calfrac Well Services Ltd ($30,000), MacLab Hotels & Resorts Ltd ($30,000), Matco Investments ($30,000), Christopher Potter ($30,000), Primrose Livestock Ltd ($30,000), Susan Rose Riddell ($30,000), Clayton Riddell ($30,000), Ronald P Mathison Private Banking Ltd ($30,000), Cathy Roozen ($30,000), Mike Rose ($30,000), Shane Homes Ltd ($30,000), Walton International Group Inc ($30,000), TIW Western ($25,000), CIBC ($23,750), Scotiabank ($23,750), BMO Nesbitt Burns Inc ($20,000), Matthew Brister ($20,000), Brian Michael Brix ($20,000), Grandview Cattle Feeders Ltd ($20,000), Kolf Farms Ltd ($20,000), Kelly Koss ($20,000), Mancal Corporation ($20,000), Kyle Ross ($20,000), Nancy Southern ($20,000), and Sunset Feeders Ltd ($20,000). During its 44 years in government the PCs were able to depend on large corporate donors to help pay off campaign bills and debts, but the party has struggled after corporate donations to political parties were banned by the first law passed by the Alberta NDP Government in June 2015. 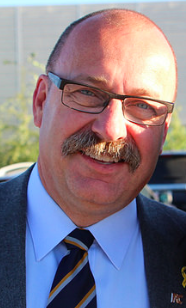 Interim leader Ric McIver initially denounced the ban, but later stood with the entire nine member PC caucus in voting in favour of the bill. The PCs will hold their annual general meeting in spring 2016 and have launched a 500-Day Plan to prepare the party for the 2019 provincial election. The PCs are expected to choose a permanent leader in early 2016. According to a report from the Calgary Herald, a new group calling themselves “ The Alberta Prosperity Fund” has launched the latest bid to unite the two main conservative parties in Alberta. The private group is reported to have looked far to the political right for inspiration by inviting American anti-tax crusader Grover Norquist as guest speaker to a closed-door session in Calgary this week. Mr. Norquist is known for his role in pushing the Republican Party further to the political right, contributing to the deep political division in America. 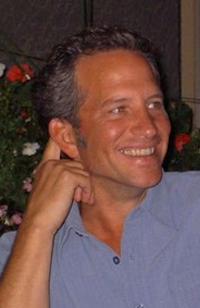 The group is headed by Barry McNamar, a former vice-president of the right-wing Fraser Institute and director of the Calgary School of Public Policy. It is unclear who is providing financial support for the Fund. This entry was posted in Alberta Politics and tagged 2016 Alberta Progressive Conservative leadership race, Alberta PC Party, Anti-tax crusader, Barry McNamar, Brian Jean, Calgary-Elbow, Calgary-Varsity, Canadian Western Bank, Debt, Edmonton-Whitemud, Elections Alberta Financial Disclosures, Grover Norquist, Money and Politics, Republican Party, Ric McIver, St. Albert, The Alberta Prosperity Fund, Unite the Right, Wildrose Party on November 19, 2015 by Dave Cournoyer. Following last week’s release of Alberta’s political party financial disclosure reports for 2014, I thought it would be interesting to look at the history of political donations in our province over the past ten years. Annual and quarterly financial disclosure reports are available for public consumption in difficult to search pdf files on the Elections Alberta website. 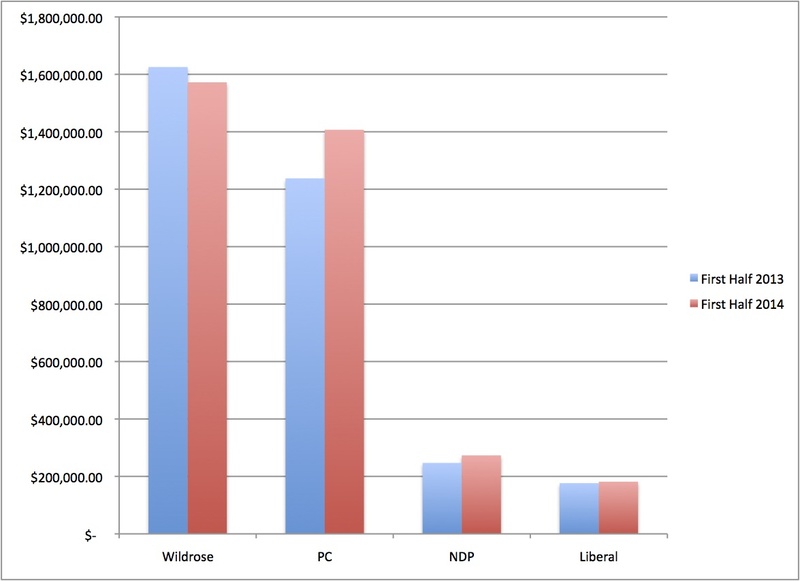 Alberta’s two main conservative parties – the Progressive Conservatives and Wildrose Party – remained the dominant forces in political fundraising in 2014. The PC Party’s impressive $3.2 million sets a record for the party, while the Wildrose Party’s $2.1 million is only slightly less than the party fundraised in the year before the 2012 election. The New Democrats collected an impressive $776,674 in donations in 2014, a record high for that party. The Liberals raised $361,112, slightly less than their 2013 fundraising totals, and the Alberta Party raised $108,837 in donations, a record for that party. The PC Party continued to rely heavily traditional corporate donors and individual donations in amounts larger than $250, while the Wildrose Party and NDP continued to collect significant amounts of funds in amounts smaller than $250 (nearly half of the Wildrose donations were in amounts smaller than $250). (Note: These charts take into account fundraising by the central parties, not constituency associations. Information about constituency association financial returns is available separately in individual pdf documents on the Elections Alberta website). 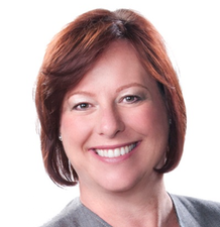 This entry was posted in Alberta Politics and tagged Alberta Fundraising, Corporate Money, Elections Alberta, Financial Disclosure, Money and Politics on April 3, 2015 by Dave Cournoyer. The total combined first and second quarter financial disclosures from Alberta’s political parties from 2013 and 2014. The latest quarterly fundraising disclosures from Alberta’s provincial political parties were released by Elections Alberta this week, and Alberta’s two conservative parties remain the dominant forces in political fundraising. Continuing a trend that has become the norm in Alberta politics, the Wildrose Party has once again raised more money than the long-governing Progressive Conservatives. 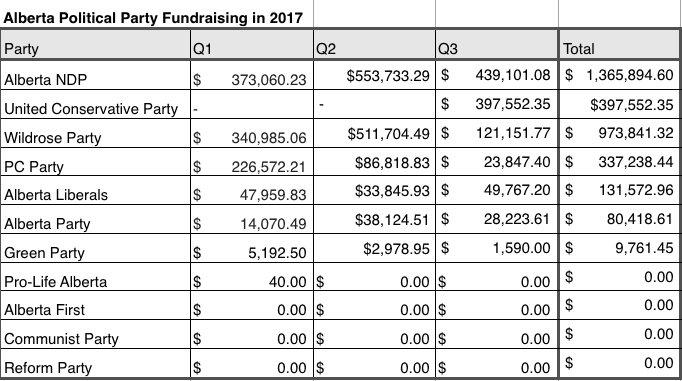 Wildrose Party raised $1,572,159.26 in the first two quarters of 2014, slightly down from their $1,625,290.94 raised during the same period in 2013. The PCs, despite their recent internal turmoil, are claiming $1,406,924.81 raised by the party in the first half of 2014, up from the $1,237,607.50 raised in the same period in 2013. Not included in these numbers are funds raised at the constituency level, where the Tories raised more than the Wildrose. This should not be a surprise, as the PC Party has 59 MLAs who form the government. That the Wildrose Party has only 17 MLAs and has continues to be successful at party level fundraising remains troubling for the long-governing PCs. While the Tories continue to show heavy reliance on large corporate donations to fill their coffers, a significant percentage of Wildrose funds come from individual donations in amounts less than $250.00. The Tories continue to show signs of weakness in constituencies represented by Wildrose MLAs. The Medicine Hat PC Association has not raised any funds since 2012 and the Innisfail-Sylvan Lake Tories claimed $300.00 in the second quarter of 2014, its first revenue since 2012. Meanwhile, the Wildrose Party appears to be dormant in two important northern constituencies – Fort McMurray-Conklin and Fort McMurray-Wood Buffalo. According to financial disclosures, the two Wildrose constituency associations have not raised any funds since 2012, when PC-turned-Wildrose MLA Guy Boutilier was unseated by Tory Mike Allen in Fort McMurray-Wood Buffalo. Looking at the other parties, the NDP showed positive growth as their fundraising numbers increased by more than $26,000 from last year to $273,214.50 in the first half of 2014. The Liberals continue to be stuck in fourth place in the fundraising department, only raising $181,385.56 in the first half of 2014. This entry was posted in Alberta Politics and tagged Alberta Political Party Fundraising, Corporate Donations, Elections Alberta, Fort McMurray-Conklin, Fort McMurray-Wood Buffalo, Graham Thomson, Guy Boutilier, Innisfail-Sylvan Lake, Medicine Hat, Mike Allen, Money and Politics on July 18, 2014 by Dave Cournoyer.